CVO reported that the strongest earthquake in the Mount Hood area in decades occurred on 29 June at 0736. The widely felt M 4.5 event was located ~4.5 km S of the summit at a depth of 6 km. Hundreds of aftershocks followed, including two greater than M 3. Typically, several earthquake swarms occur each year at Mount Hood. 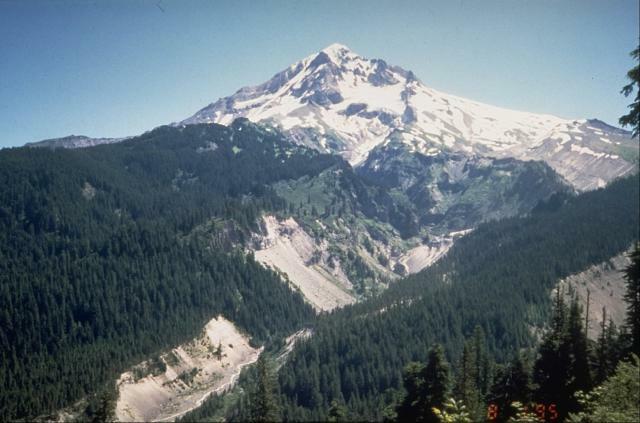 The strongest earthquake in the Mount Hood area in decades occurred on 29 June 2002 at 0736, according to the USGS Cascades Volcano Observatory (CVO). The widely felt M 4.5 event was located ~4.5 km S of the summit (figure 3) at a depth of 6 km. Hundreds of aftershocks followed, including two greater than M 3. Typically, several earthquake swarms occur each year at Mount Hood. Figure 3. A map of all earthquakes (M 1.0) that occurred at Hood from the start of 2001 to 29 June 2002. The area shown details a few kilometers around the M 4.5 event on 29 June 2002. Courtesy PNSN. 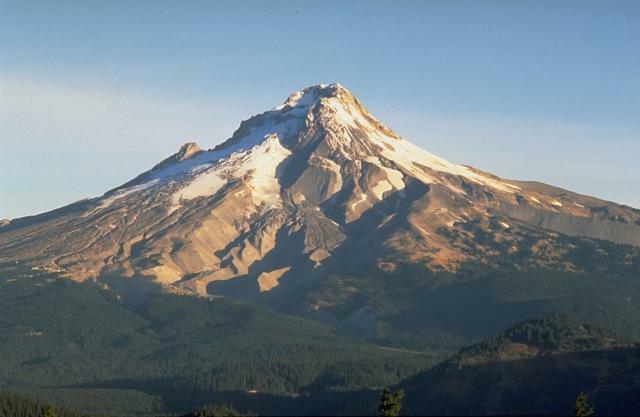 Information Contacts: Cascades Volcano Observatory (CVO), United States Geological Survey (USGS), 5400 MacArthur Blvd., Vancouver, WA 98661, USA (URL: https://volcanoes.usgs.gov/observatories/cvo/); Pacific Northwest Seismograph Network (PNSN), University of Washington, Department of Earth and Space Sciences, Box 351310, Seattle, WA 98195-1310, USA (URL: http://www.ess.washington.edu/SEIS/PNSN/). 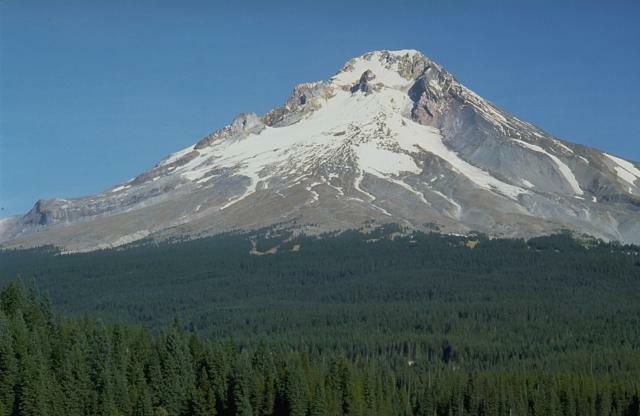 The USGS Cascades Volcano Observatory reported that a minor earthquake swarm occurred at Mount Hood from 9 September until at least 14 September. About 25 events were detected, with a maximum magnitude of 2.9. The epicenters of the earthquakes were ~8 km SSW of the volcano's summit at depths of 1-7 km. These types of swarms occur once or twice per year at Mount Hood. The Cascades Volcano Observatory (CVO) reported that during 10-20 January a swarm of 13 earthquakes with magnitudes ranging from 0.2-2.0 occurred in an area about 4-8 km SSE of the summit at a depth of 4-7 km. This activity is not abnormal; Mount Hood averages one to two small swarms a year, with the last swarm occurring in May 2000. The current swarm consisted of fewer and smaller events than is typical, but it may not have yet ended. Figure 1. Histogram of seismic activity at Mt. Hood, 6-20 July 1980, after Rite and Iyer (1981). Figure 2. Epicenters of most of the July 1980 events at Mt. Hood. Sizes of crosses are proportional to event magnitudes. After Rite and Iyer (1981). The USGS issued a hazard watch formally notifying government officials. On 11 July, the USGS and the University of Washington installed three portable seismographs on Mt. Hood. No harmonic tremor has been recorded, and no new surface activity has been observed. Gas analyses made from aircraft on 11 July showed no increase in atmospheric SO2 or CO2 above normal levels. Because no additional seismicity and no new eruptive activity have occurred at Mt. Hood, the USGS ended the hazard watch on 5 August. References. Rite, A., and Iyer, H.M., 1981, July 1980 Mt. Hood earthquake swarm: USGS Open File Report 81-48, 22 p.
Information Contacts: R. Decker, R. Tilling, and C. Zablocki, USGS; S. Malone, R. Crosson, and E. Endo, Univ. of Washington. An earthquake swarm occurred near Mount Hood in northern Oregon beginning on 11 January. More than two dozen earthquakes were produced that day, the largest of which were M 3.2 (at 1404) and M 3.0 (at 0854). Following a pause during 12-13 January, a M 3.2 earthquake at 0356 and a M 3.0 earthquake at 0813 occurred on 14 January. The largest earthquakes were felt at Timberline, Brightwood, Parkdale, and Mount Hood Meadows. By noon on 14 January the Cascades Volcano Observatory had detected 66 earthquakes, 33 of them large enough to be well-located. All of the earthquakes in the recent swarms had characteristics similar to tectonic earthquakes rather than volcanic earthquakes (indicative of magma movement). They most likely resulted from regional tectonic stresses, although they may have also been caused by deep-seated changes in the volcano's plumbing system. Additional and significantly different geological and geophysical indicators would be expected before any future eruptive activity. Scientists will continue to monitor the situation closely. They may add additional instrumentation to the monitoring network to learn more about earthquakes in this region. Since 1990 Hood has produced about fifteen earthquake swarms similar to the recent one. These swarms have lasted from a few hours to several days and have generally produced maximum magnitudes between 1.6 and 3.5. Many earthquakes have been well-located, and are generally clustered 4-7 km S of the volcano's summit. Seismic data of lower quality suggest that swarms also occurred in the 1970s and 1980s. 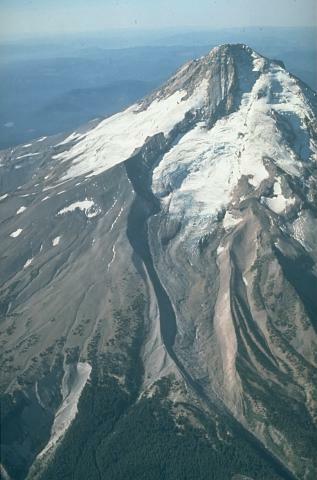 The largest recorded earthquake at Mount Hood was a M 4.0 in December 1974. Information Contacts: Cascades Volcano Observatory, U.S. Geological Survey, 5400 MacArthur Blvd., Vancouver, WA 98661 USA (URL: https://volcanoes.usgs.gov/observatories/cvo/); Geophysics Program, University of Washington, Seattle, WA 98195 USA (URL: http://www.geophys.washington.edu/). After the earthquake swarms in January 1999 (BGVN 24:01), two reports of anomalous activity at Hood were received; in September and October of 2000 landslides and debris flows traveled down the flanks of the volcano, and in January 2001 small earthquake swarms occurred. The Cascades Volcano Observatory (CVO) reported that intense rainfall during 30 September to 1 October 2000 triggered a series of landslides and debris flows in several of Hood's drainages. The largest flows occurred in White River Valley on the S flank and Newton Creek Valley on the E flank. Both streams were diverted from their channels and severely damaged two sections of Oregon Highway 35; one section is an important link between I-84 and US 26, and the other is a recreational highway that provides access to Mount Hood Meadows Ski Area. The landslides and debris flows caused more than $1 million in damage. The Oregon Department of Transportation reopened the highway on 27 October. According to CVO, a small earthquake swarm occurred at Hood during 10-19 January 2001. During this period a swarm of 13 earthquakes, with magnitudes ranging from 0.2-2.0, occurred in an area ~4-8 km SSE of the summit at a depth of 4-7 km. This area is frequently a source of earthquake swarms, but this swarm consisted of fewer and smaller events than is typical. The last similar type of swarm occurred in May 2000. On average, 1-2 swarms of small earthquakes occur at Hood each year. 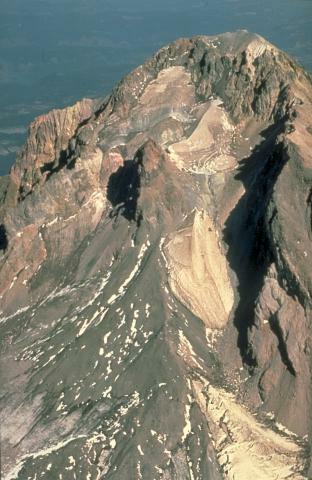 Information Contacts: Cascades Volcano Observatory, U.S. Geological Survey, 5400 MacArthur Blvd., Vancouver, WA 98661 USA (URL: https://volcanoes.usgs.gov/observatories/cvo/). 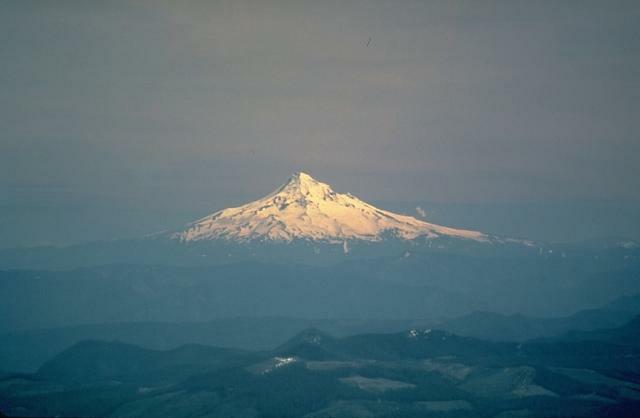 Mount Hood, Oregon's highest peak, forms a prominent backdrop to the state's largest city, Portland. The eroded summit area consists of several andesitic or dacitic lava domes. Major Pleistocene edifice collapse produced a debris avalanche and lahar that traveled north down the Hood River valley and crossed the Columbia River. The glacially eroded volcano has had at least three major eruptive periods during the past 15,000 years. The last two occurred within the past 1800 years from the central vent high on the SW flank and produced deposits that were distributed primarily to the south and west along the Sandy and Zigzag rivers. The last major eruptive period took place beginning in 1781, when growth of the Crater Rock lava dome was accompanied by pyroclastic flows and lahars down the White and Sandy rivers. The Sandy River lahar deposits extended to the west as far as the Columbia River and were observed by members of the 1804-1805 Lewis and Clark expedition shortly after their emplacement. Minor 19th-century eruptions were witnessed from Portland. Cameron K A, Pringle P T, 1987. A detailed chronology of the most recent major eruptive period at Mount Hood, Oregon. Geol Soc Amer Bull, 99: 845-851. Cameron K A, Pringle P T, 1991. Prehistoric buried forests of Mount Hood. Oregon Geol, 53: 34-43. Crandell D R, 1980. Recent eruptive history of Mount Hood, Oregon, and potential hazards from future eruptions. U S Geol Surv Bull, 1492: 1-81. Cribb J W, Barton M, 1997. Significance of crustal and source region processes on the evolution of compositionally similar calc-alkaline lavas, Mt. Hood, Oregon. J. Volcanol. Geotherm. Res., 76: 229-249. Pringle P T, Pierson T C, Cameron K A, Sheppard P R, 2010. Late 18th century Old Maid eruption and lahars at Mount Hood, Oregon (USA), dated with tree rings and historical observations. In: Stoffel M, Bollschwieler M, Butler D R, Luckman B H (eds), Tree Rings and Natural Hazards: A state-of-the-art, Berlin: Springer-Verlag, p 487-491. Wise W S, 1969. Geology and petrology of the Mount Hood area: a study of High Cascades volcanism. Geol Soc Amer Bull, 80: 969-1006. Wise W S, 1968. Geology of the Mount Hood volcano. Oregon Dept Geol Min Ind Bull, 62: 81-98. There is no Deformation History data available for Hood. There is no Emissions History data available for Hood. Mount Hood, seen here from the north across the Columbia River Gorge, rises dramatically above low hills of older volcanic rocks. Located only 75 km ENE of Portland, Mount Hood is a popular recreation mecca for backpackers, climbers, skiers, and others who appreciate one of the scenic highlights of the Oregon Cascades. Photo by U.S. Geological Survey, 1983. Mount Hood, seen here from Larch Mountain on the NW side, is Oregon's most recently active volcano. A major eruptive period occurred 170-220 years ago, and 19th-century Pacific Northwest Indians and settlers observed minor eruptions. 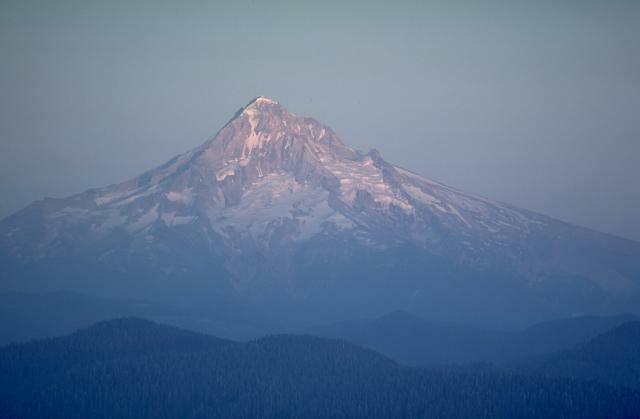 Sharp-topped Mount Hood, Oregon's highest peak, rises above the Lolo Pass area on its NW side. Hood is a prominent landmark on both sides of the Columbia River. The summit of the glacially eroded volcano contains several lava domes. At least four major eruptive periods have occurred during the past 15,000 years, the last of which was only about 170-220 years ago. Minor 19th century eruptions were witnessed from Oregon's largest city, Portland. The upper Sandy River valley on the SW side of Mount Hood has been one of the primary channels for lahars associated with eruptions during the past 1800 years. These late-stage eruptions originated from vents high on the SW flank of the volcano. Photo by Willie Scott, 1995 (U.S. Geological Survey). This aerial view of Mount Hood from the south shows the Crater Rock lava dome in the center of the photo. Formation of the 400-m-wide, 170-m high Crater Rock dome is dated at about 1765 CE from tree-ring counts of wood in mudflows associated with growth of the dome. Episodic dome growth and associated pyroclastic flows and lahars took place until about 1800 CE. Trillum Lake provides a dramatic view of the broad debris fan on the south flank of Mount Hood that originated from growth of the Crater Rock lava dome, visible on the upper SW flank just below the summit. Debris shed off the growing lava dome during the late 18th century formed the undissected fan, which provides year-round skiing from the Timberline ski area. 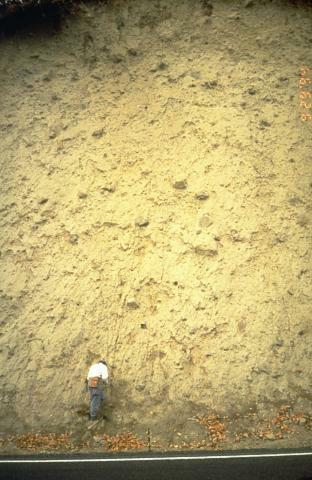 Photo by Dave Wieprecht, 1993 (U.S. Geological Survey). Oregon's highest peak, Mount Hood, rises to 3426 m. This view from Frog Butte on the SE side shows the canyons of the White River in the center, and the smooth debris fan to its left that formed during of growth of the Crater Rock lava dome just south of the summit. Illumination Rock forms the knob midway up the left skyline. This aerial view from the NE shows Eliot Glacier descending the steep-walled valley at the center, with prominent glacial moraines at its base. During the late Pleistocene a major lahar from Mount Hood swept to the north across the Columbia River, temporarily filling it to a depth of 30 m.
Photo by Richard Waitt, 1983 (U.S. Geological Survey). The north flank of Mount Hood is cut by the Eliot Glacier, with a series of prominent glacial moraines at its base. 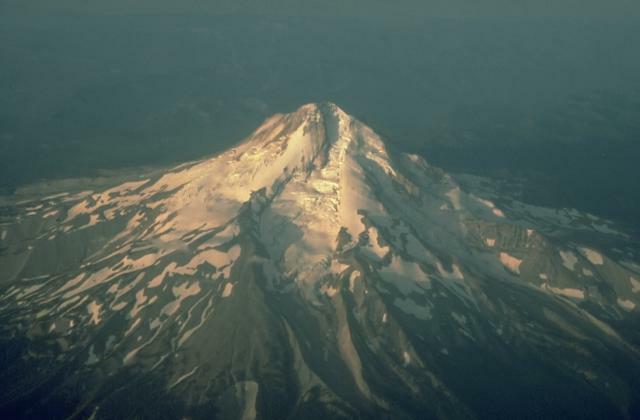 During the past 1800 years eruptions of Mount Hood have been restricted to vents on the SW flank, resulting in proportionately more erosional dissection of the north flank of the volcano. Photo by Willie Scott, 1987 (U.S. Geological Survey). 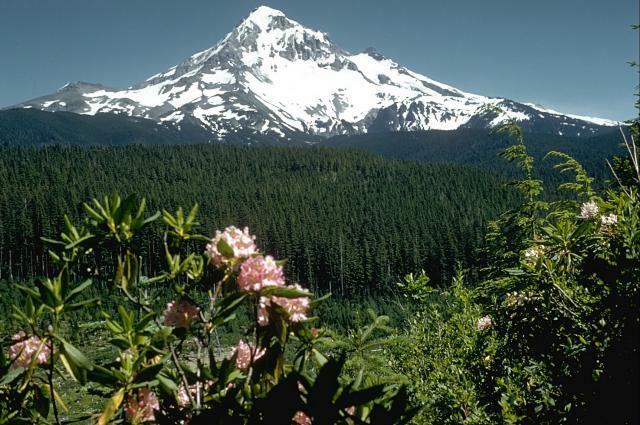 Oregon's Mount Hood is one of the most frequently climbed volcanoes in the Cascade Range. 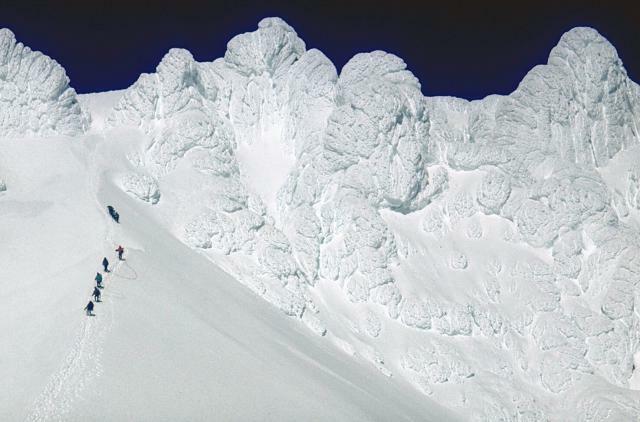 A group of climbers above the base of Crater Rock lava dome on the upper SW flank approaches the ice-draped Steel Cliffs, which form the summit ridge. Scientists from the U.S. Geological Survey take gas samples at Devils Kitchen near the Crater Rock lava dome on the upper SW flank of Mount Hood. The Crater Rock area is the largest fumarole field in the Oregon Cascades, producing vigorous gas emission and extensive hydrothermal alteration of rock masses over broad areas. 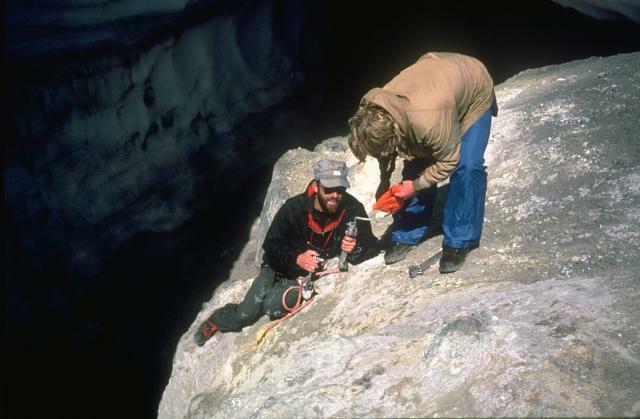 Photo by Bill Chadwick, 1982 (U.S. Geological Survey). A massive volcanic mudflow produced by collapse of Mount Hood during the Pleistocene swept down the Hood River valley and traveled across the Columbia River, temporarily damming it to a depth of 30 m. This thick outcrop of the mudflow deposit, containing rounded boulders in a clay-rich matrix, is located north of Underwood, Washington, on the other side of the Columbia River. Photo by Willie Scott, 1994 (U.S. Geological Survey). 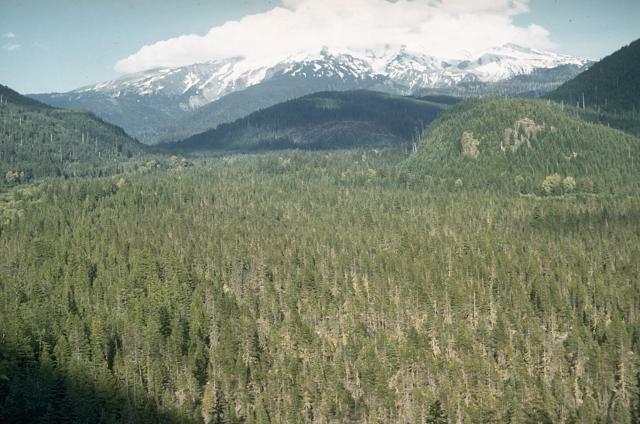 The flat-bottomed, forested floor of the upper Sandy River is underlain by volcanic mudflow deposits associated with growth of the Crater Rock lava dome on the upper SW flank of Mount Hood. Tree-ring dating places the age of these deposits during the mid-1790's. The lahars traveled as far as the Columbia River, and the shallow, sediment-choked lower Sandy River was observed shortly after emplacement of the lahars by the Lewis and Clark expedition. Photo by Richard Fiske, 1959 (Smithsonian Institution). 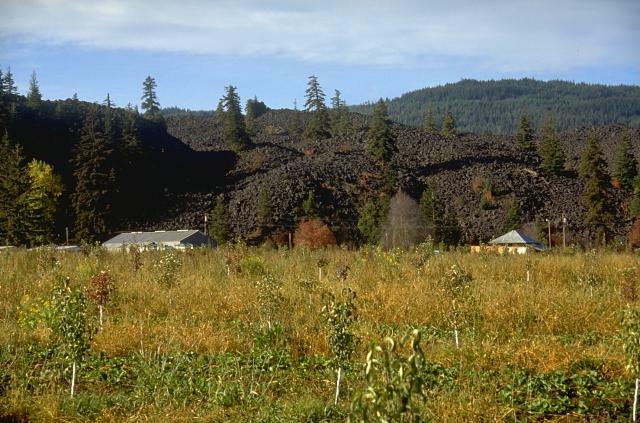 The blocky Parkdale lava flow, which traveled 6 km from a cinder cone located along the Middle Fork Hood River near the north flank of Mount Hood, towers above houses in the agricultural Hood River valley. The Parkdale flow has been radiocarbon dated at about 6890 years. IRIS seismic stations/networks Incorporated Research Institutions for Seismology (IRIS) Data Services map showing the location of seismic stations from all available networks (permanent or temporary) within a radius of 0.18° (about 20 km at mid-latitudes) from the given location of Hood. Users can customize a variety of filters and options in the left panel. Note that if there are no stations are known the map will default to show the entire world with a "No data matched request" error notice. Large Eruptions of Hood Information about large Quaternary eruptions (VEI >= 4) is cataloged in the Large Magnitude Explosive Volcanic Eruptions (LaMEVE) database of the Volcano Global Risk Identification and Analysis Project (VOGRIPA).